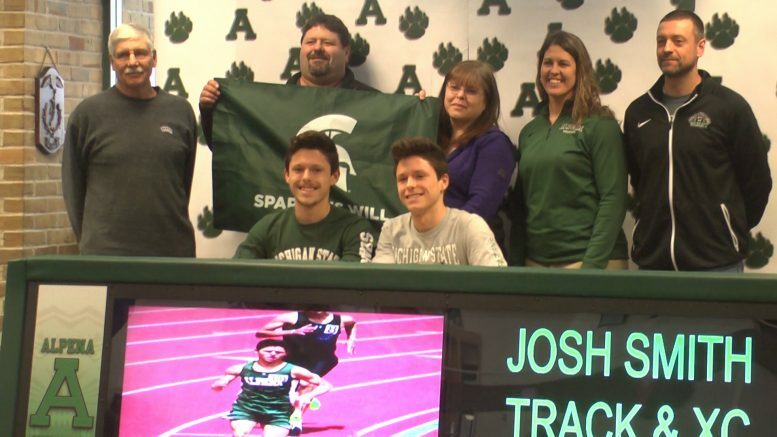 Twin brothers, Aden and Josh Smith, sign to compete with MSU for track and cross country. Alpena, Mich. — The Alpena Wildcats had many seniors put pen to paper for signing day. Logan Guthrie signed to play college football at Central Michigan in December and then seven more committed in February for national signing day: Madelyn Boyd (Central Michigan, Track and Field and Cross Country), Emma Fraser (Alma College, Softball), Jessica Leeck (Alpena Community College, Volleyball), Aden Smith (Michigan State, Track and Field and Cross Country), Josh Smith (Michigan State, Track and Field and Cross Country), Faith Weide (Western Michigan, Track and Field) and Zachary Zaborney (University of Detroit Mercy, Track and Field). Other Alpena notables include Aidan Day who plans to sign with Colorado Christian University for soccer and Alexis Pilarski and Allison Precord to play volleyball at Alpena Community College. Josh Smith (Michigan State): (Cross Country) 3-time All-Conference, 1-time BNC Team Champ, 3-time All-Region, 2-time Regional Team Champ, 3-time State Qualifier, 2-time All-State and #2 time in AHS history at 15:41. (Track and Field) 800 meter All-Conference, 1600 meter All-Conference and All-Region, 4×800 meter relay 3-time All-Conference, 2-time All-Region, 1-time All-State, school record for 4,800 meter relay and school record for 1600 meter run. Aden Smith (Michigan State): (Cross Country) 2-time All-Conference, 2-time BNC Champ, 1-time BNC Team Champ, 4-time All-Region, 2-time Regional Team Champ, 4-time State Qualifier, 3-time All-State and #3 time in AHS history at 15:43. (Track and Field) 1600 meter All-Conference, 3200 meter All-Conference and 2-time All-Region, 4×800 meter relay 3-time All-Conference, 2-time All-Region and 1-time All-State. Maddy Boyd (Central Michgan): (Cross Country) 2-time All-Conference, 2-time All-Region, 2-time State Qualifier, 1-time All-State and AHS school record at 18:30. (Track and Field) 1600 meter AHS school record, 2-time All-Conference and 2-time All-Region, 3200 meter run All-Conference and All-Region, and 1600 meter relay All-Region. Faith Weide (Western Michigan): (Track and Field) All-Region 3-time shot put and 2-time discus, Regional Champion in shot put, All-Conference 3-time in shot put and 2-time in discus, and BNC Champion in shot put and discus. Zachary Zaborney (University of Detroit Mercy): 1-time All-Conference long jump, 1-time All-State triple jump and #4 AHS long jump at 20′ 1.5″. Emma Fraser (Alma College): Junior stats – .540 batting average, 137 at bats, 57 runs, 74 hits, 5 home runs, 39 RBI’s and 9 strikeouts. 3 home runs at Regionals and All-State and All-Conference first team.